Remember, sometimes things are done differently depending on your own situation, so it’s totally fine if you don’t follow these steps exactly! In my experience as a wedding planner, this order has shown to be the best way to go. 🙂 And most of all, don’t forget WHY you’re planning a wedding! HAPPY PLANNING!!! You want the catering at the reception to be just right. You want to select just the right wedding favors. If so, contact us at www.thefloralbouquet.ca. You need to coordinate the transportation very carefully. But the wedding ceremony is the very heart of the entire wedding. Far from creating anxiety, this task can be carried out with great success once you handle the process one step at a time. The first steps will involve considering the decorations for the actual ceremony. It can be something as simple as colorful bows tied onto the pew. Or, it can involve hiring a wedding florist decorator to completely deck out the venue with flowers, ribbons, a lovely arch or chuppah, and more. The type and style of decorations will very much depend on the venue you reserved. You will want to give some thought to music. Some couples play background music before the ceremony and at various times during the event. Music helps set the mood from the moment the first guest enters. It can be the traditional tunes or it may be your favorite Beach Boys song to enhance your chosen theme. Whatever you choose, don’t overpower everyone with it. It should be in the background. You are in the foreground. Another note to mention is that if you are getting married in a church, make sure you ask first regarding music. Some churches have rules about music and what types of music can be played. 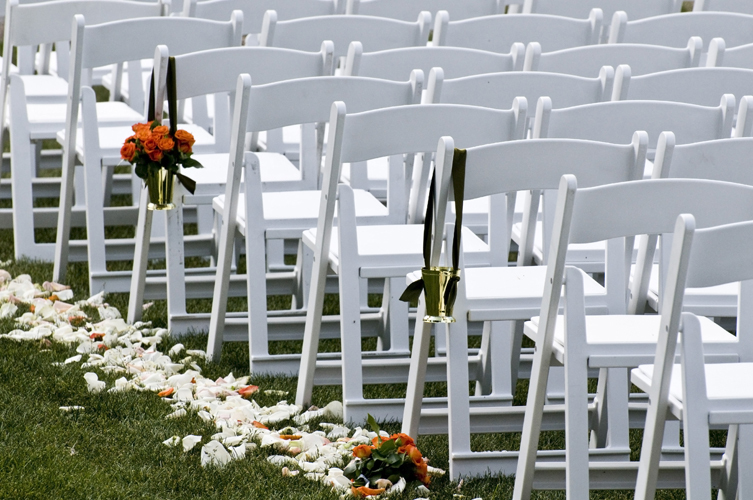 You’ll want to sketch out and rehearse the processional. The ring bearer and flower girl are still part of many ceremonies. The parents of the bride and groom often walk down the aisle. Naturally, the entrance of the bride needs to be coordinated. Many choose to add personal touches within each of these standard steps. For example, the priest and groom may enter from the side door, then the groomsmen and bridesmaids enter. Usually those furthest from the bride and groom go first. But there are many variations depending on religion, custom and personal choice. You’ll want to plan out your vows. Many choose to follow the tradition of repeating the chosen words of a priest or pastor or Justice of the Peace. Others prefer a more contemporary ceremony in which the bride and groom read or speak something that carries a deep personal meaning for them. You may create your own small speech from scratch. Or, you can choose from hundreds of sources. There are many different kinds of ceremonies that might help: examples such as exchanging roses (a rose ceremony); lighting a pair of candles (a candle ceremony); or pouring different colored sands into a single container (sand ceremony). These and many other simple actions all help convey the symbolism involved in the wedding ceremony. Then there are the actions that are still part of nearly every ceremony: an exchange of rings. This is easily ironed out in rehearsal, but take care to ensure that all are informed of and practice their roles. The best man fumbling for the ring for two minutes is only amusing in the movies. Don’t forget that all important moment; The first kiss! Practice removing any veil, how long the kiss will last and other actions. Some things about the wedding should be spontaneous. This part should be choreographed so that the guests remember what you want them to remember.